Human relevance in the seemingly infinite Universe in which we live is the topic of 2019 Benjamin and Elaine Whiteley Distinguished Lecture at Pacific University. 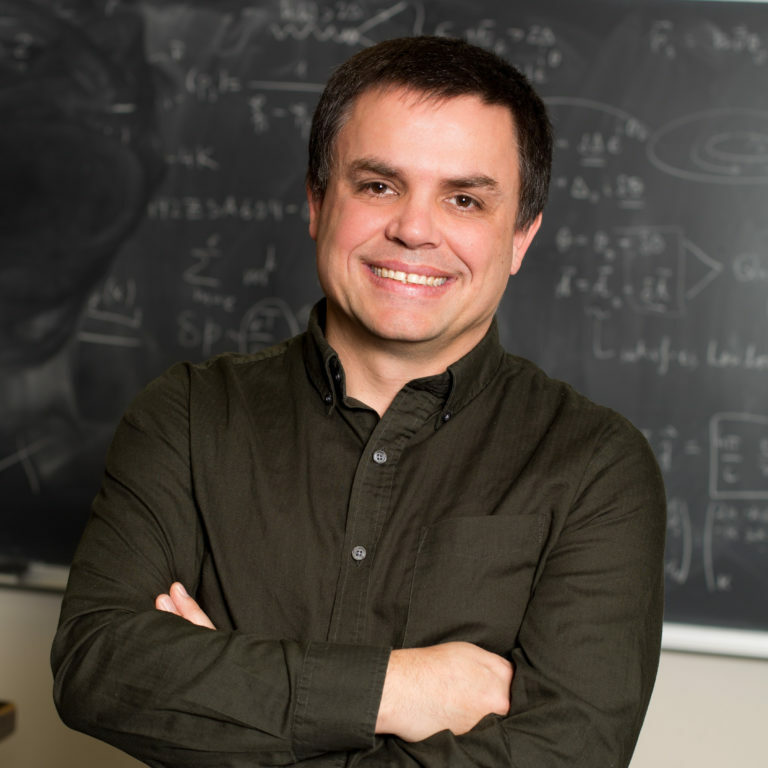 Dr. Shane Larson, research associate professor of physics at Northwestern University, will present “Feeling Small in a Big Cosmos” at 7 p.m., Wednesday, Feb. 27 in McGill Auditorium on the university’s Forest Grove Campus (2043 College Way). Admission is free. Larson will examine how newfound knowledge has continually forced society to abandon cherished ideas about the universe. “Whereas there was a time when we believed Earth and humanity were the center of all things, we now collectively realize that we are just one small part of the greater Cosmos,” he says. In addition to his faculty appointment at Northwestern, Larson also serves as associate director of the university’s Center for Interdisciplinary Exploration and Research in Astrophysics. He works in the field of gravitational wave astrophysics, specializing in studies of compact stars, binaries and the galaxy. He also works in gravitational wave astronomy with both the ground-based Laser Interferometer Gravitational-Wave Observatory project (LIGO) and the Laser Interferometer Space Antenna project (LISA). A native of Eastern Oregon, Larson holds a PhD in theoretical physics from Montana State University, and is a former postdoctoral scholar at NASA’s Jet Propulsion Laboratory, Caltech and at Penn State’s Center for Gravitational Wave Physics. He is a fellow of the American Physical Society and an avid amateur astronomer, having built two telescopes at his home for viewing the sky. Dr. Larson is also a regular contributor to writescience.wordpress.com public science blog, and tweets under the handle @sciencejedi. Pacific University’s Benjamin and Elaine Whiteley Distinguished Lecture is an annual offering of the College of Arts & Sciences funded through an Oregon Community Foundation grant. Philanthropic support of Pacific University is paving the way to expanded opportunity and innovation for students through the Lead On: Campaign for Tomorrow. This year’s Whiteley lecture is presented by the college’s School of Natural Sciences. A longtime Portland business, civic and philanthropic leader who ran The Standard insurance company and several other companies throughout his career, Benjamin Whiteley, Hon. ’01, was a Pacific University Trustee Emeritus who passed away two years ago at the age of 87. Past Whiteley series lecturers include ethicist Peter Singer (2016), environmental activist Lois Gibbs (2014), Olympic athlete and civil rights activist John Carlos (Fall 2012), filmmaker and author Bill Carter (Spring 2012), evolutional biologist Sean Carroll (2011), and Eric Schlosser (2010), investigative journalist and author of Fast Food Nation. Pacific University is a small, but diverse learning community, where students thrive in a personal academic environment. Tracing its roots to 1849, when it was chartered as a school for orphans of the Oregon Trail, Pacific has long been devoted to making a difference in the world. Today, students study in a unique combination of undergraduate, graduate and professional programs in the liberal arts and sciences, business, education, health professions and optometry. Located in Oregon, Pacific serves a diverse population of more than 3,900 students, with campuses in Forest Grove, Hillsboro, Eugene and Woodburn. At Pacific University, students and faculty develop close, nurturing relationships that provide an extraordinary educational experience. Next PostNext Anne Frank: Her Photos. Her Story. Beaverton Arts Program Announces Community Grants! Family Events To Squeeze Out The Last Bit Of Summer Fun!